As experts in food and nutrition, RDs use their knowledge to help individuals make healthful lifestyle changes. 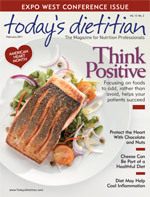 To recognize the profound role RDs play in people’s lives, the American Dietetic Association (ADA) established Registered Dietitian Day (RD Day), which this year falls on March 9. So how are you going to celebrate? The carnival idea was inspired by Renata Mangrum, MPH, RD, who then reached out to other RDs to see who might be interested. “As an organization with several RDs and a wealth of science-based nutrition information as well as communications expertise and a popular blog of our own, we felt like it was a natural fit to participate,” Mittenthal says. This year, Levine plans to celebrate RD Day in a big way. “I will continue to give discounted rates for first-time customers who schedule a session on RD Day, and I will share my golden rules for healthy living on my regular column on Livestrong.com.” She also plans to write a blog post about the differences between an RD and a nutritionist, such as the schooling required for each. Similar to her efforts last year, Erker plans to keep prevention through nutrition on the front burner by continuing to educate the staff and clients about the benefits of eating for health with the use of handouts and having fresh fruit and vegetables available for all to enjoy throughout the day. “My suggestion for RDs is to keep it simple by continuing to spread the word about prevention through nutrition by eating more whole food throughout the day,” Erker says. — Maura Keller is a Minneapolis-based freelance writer and editor.